With the 2018 Tour de France just days away, Specialized is eyeing the podium with their fastest, lightest, most aerodynamic competition road bike to date. 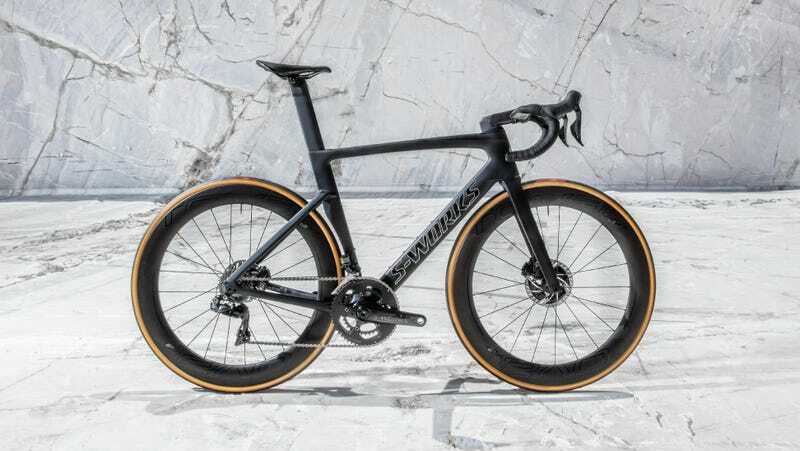 If you’ve ever involuntarily slowed to a saunter to gawk at a rare parked supercar, that’s what it’s like to behold Specialized Bikes new 2019 S-Works Venge. The latest generation Venge will hold you motionless with its looks and leave you pondering its seemingly impossible specs. Before running the first test frame through their in-house wind tunnel (dubbed the Win Tunnel,) Specialized started their third generation Venge frame design by developing a computer program that generated millions of variations of tube shapes by taxing a super-computer for more than a month. Engineers used the resulting data, racer feedback, and over 40,000 cyclist data points collected by Retül to guide their meticulous design of the 2019 Venge. Formed from over 400 pieces of individually engineered and placed carbon fiber pieces, this third-gen Venge frame weighs just 960 grams, about the same as a quart of milk. The end result is a bike that’s simultaneously more aerodynamic and lighter than any previous Specialized releases, a feat they’ve not been able to capture with just one frame, until now. This combination makes it faster than their Venge Vias, the fastest UCI legal race bike at launch. Specialized has done nothing less than create a cycling masterpiece with the new Venge. Having broken countless in-house records, they now hand the 2019 Venge off to their customers, racers, and teams to dominate the world stage. It’s already covertly claimed more than ten wins in “Project Black” races.